And so the Adventure Begins … Again! After nine months – and what felt like eternity – I am thrilled to say the Soap Challenge Club is back in business, Baby! For those of you who haven’t followed my ramblings and have no idea what the Soap Challenge Club is, it’s an opportunity for soap makers all over the world to enhance their skills, meet amazing people and compete for fabulous prizes. I’ve said it a million times, and I’ll say it again…I would not be where I am today if it weren’t for the Soap Challenge Club. 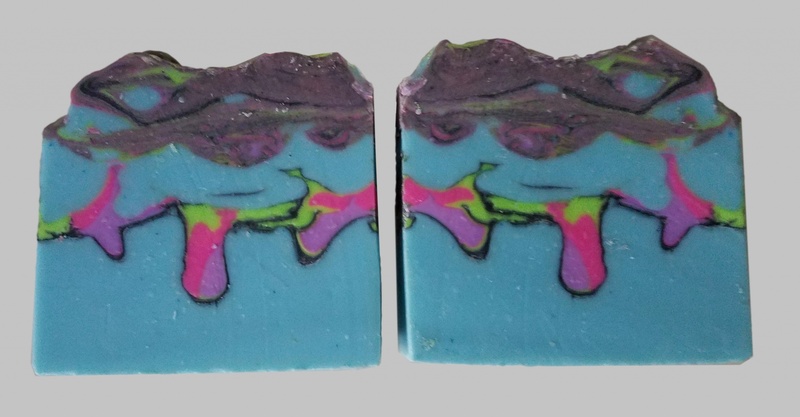 The challenge presented to us this month was to create a soap using the Mini Drop Swirl technique. Amy has changed a few things with the Club and it is now divided into two categories, Regular and Advanced. Amy presented two different ways to accomplish the technique and the guidelines for each category. To achieve the mini drop swirls, you need to use squeeze bottles to create the appearance of drops. 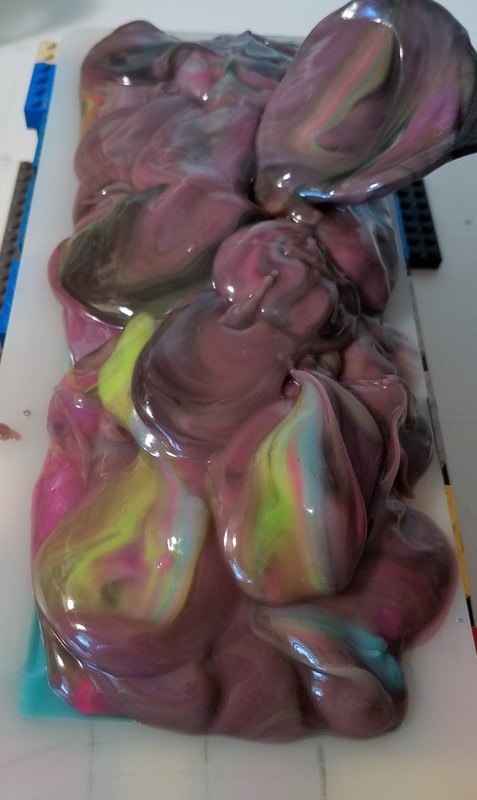 To create drop swirls in the top half of the soap, as required for the Regular category, you begin by filling your mold approximately half way up with the main base color. You then use the squeeze bottles, placing the tips closer to the surface of the batter, to make lines up and down the length of the mold. 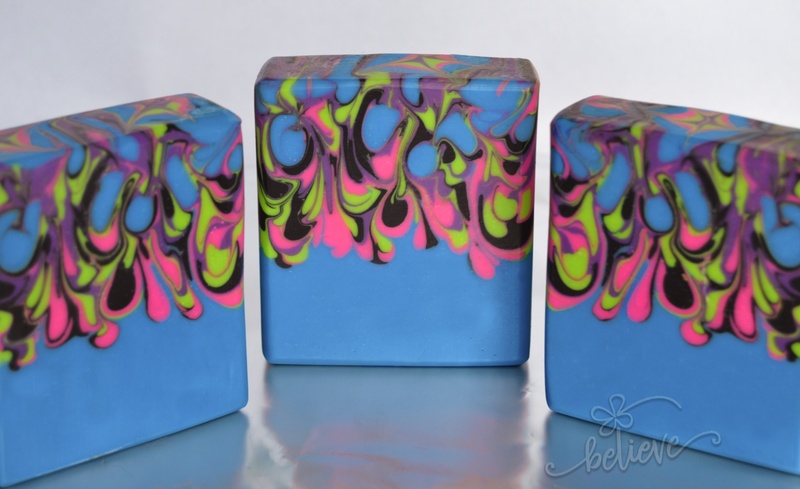 The biggest difference between the mini drop swirl and traditional drop swirl technique is that with the mini drop swirl, you pour lines of soap so that they lay on top of the batter. As you build the lines up, the weight from the lines push everything down in to the base, forming drops. 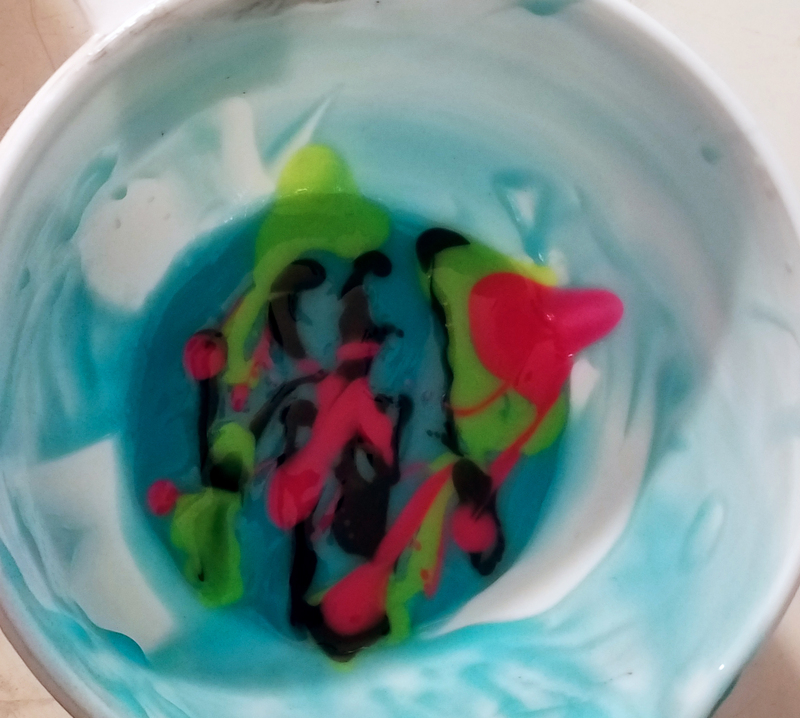 For regular drop swirls, you add the soap from a much higher distance above the batter to create swirls in the base below. In typical Debi fashion, I jumped in full-speed and started devising super extravagant methods in hopes of creating an entry for the Advanced category. 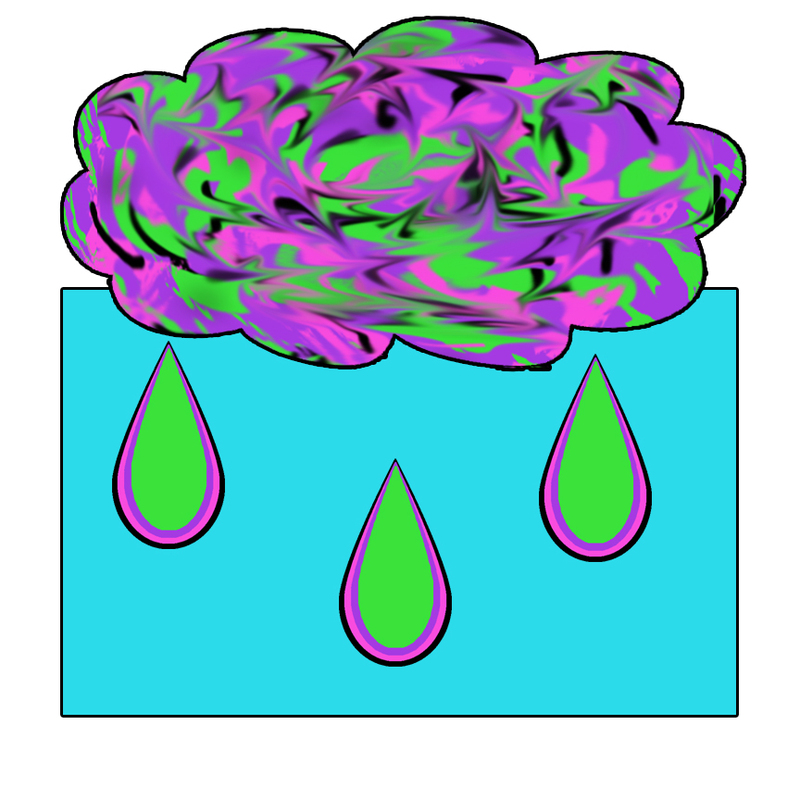 I envisioned drops that were perfectly layered with different colors, and topped with a cloud containing those colors above it. 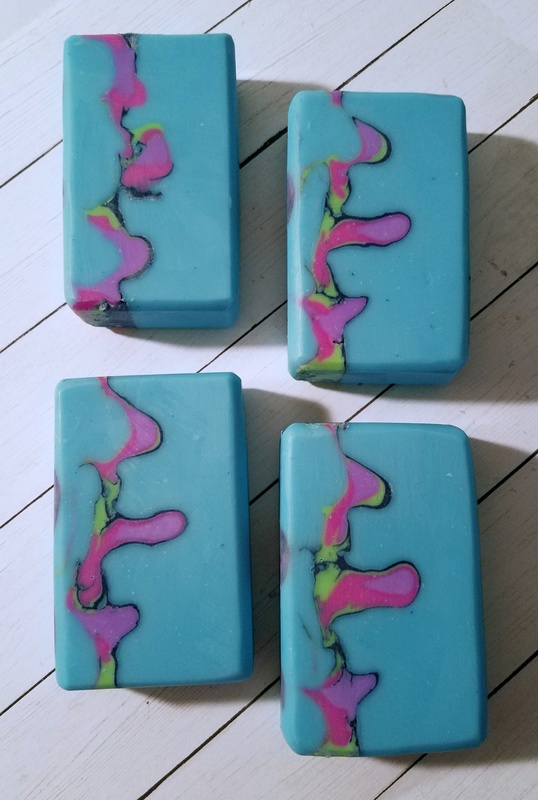 I was hoping to make it look like the drops of the cloud were dripping down into the soap. To create the perfectly layered drops, I knew I needed to keep the tip in the exact same position as I poured each color. I devised guides to help keep me in the same spot each time. 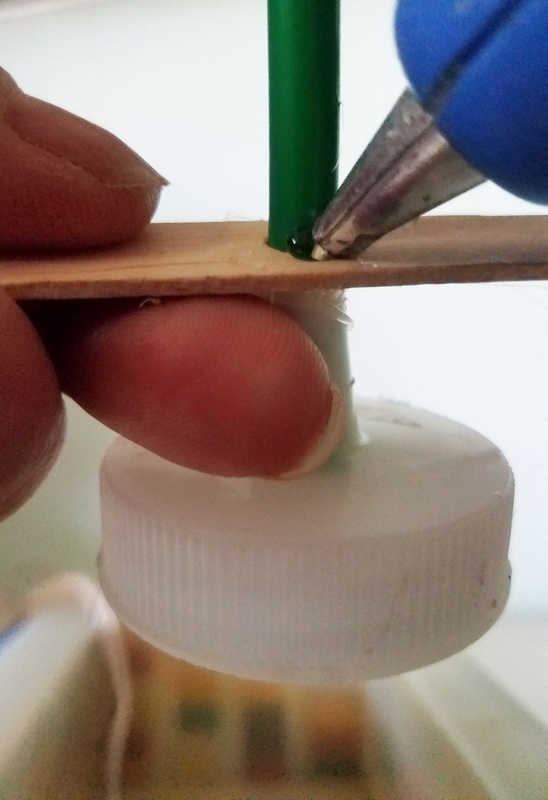 My thoughts were to lay the first colored layer of all three drops into the base, then snip off a tiny bit of the straw, bringing the tips up a little higher. I’d then pour the next layer, repeating the steps for each layer of color in the drops. I figured I would only need two bottle lids, one for the two drops on the side and one for the middle, and I would switch the lids between the colors. I ended up cutting two straws and placed them in the tips of my squeeze bottle lids. 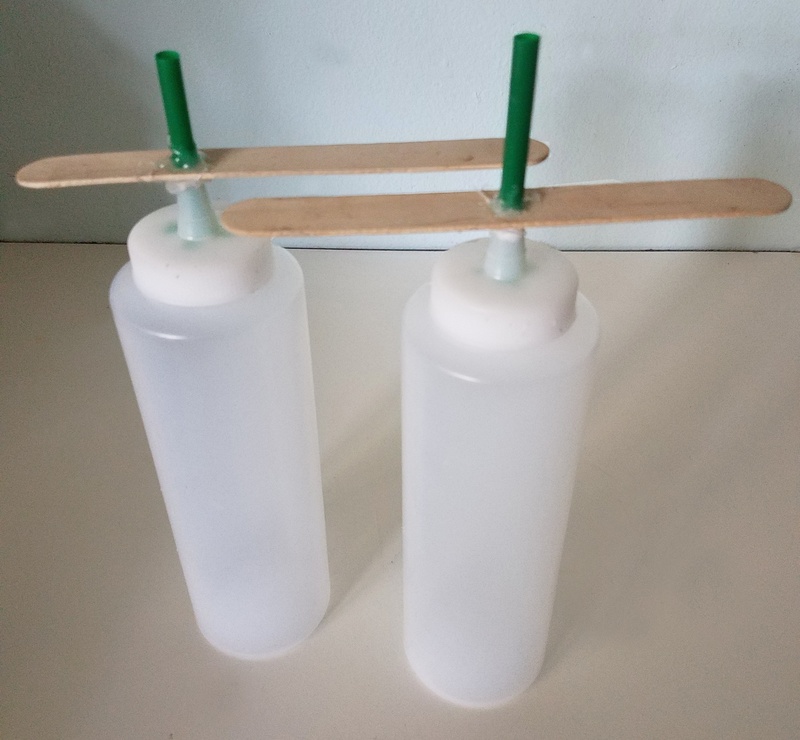 I then drilled holes in two wide popsicle sticks to accommodate the straws and hot-glued around the tip and the stick to seal it. I was excited to begin and confident that my idea would work exactly as planned. I poured my base and placed my first bottle in the soap. The first problem I encountered was when I realized I hadn’t calculated very well and hadn’t poured enough base. The tip for the side drops only skimmed the top surface of the soap. To accomplish drops, I needed the tips deeper down and I knew immediately that I had messed everything up. Yes, those are indeed Legos! I use them to brace the sides of the mold to keep them for bowing out. I quickly realized the second problem. 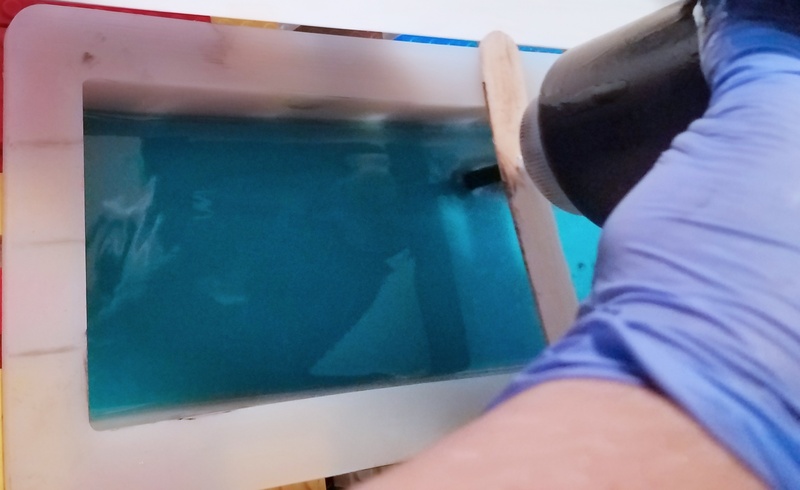 The batter in the bottle was extremely thin and poured out quickly when I placed the bottle in for the first color layer. I couldn’t exactly pour more base at this point so I moved ahead, hoping I could squeeze the bottle a little bit harder to force it in a little deeper. I persevered, but I was fully aware it all had gone terribly wrong. 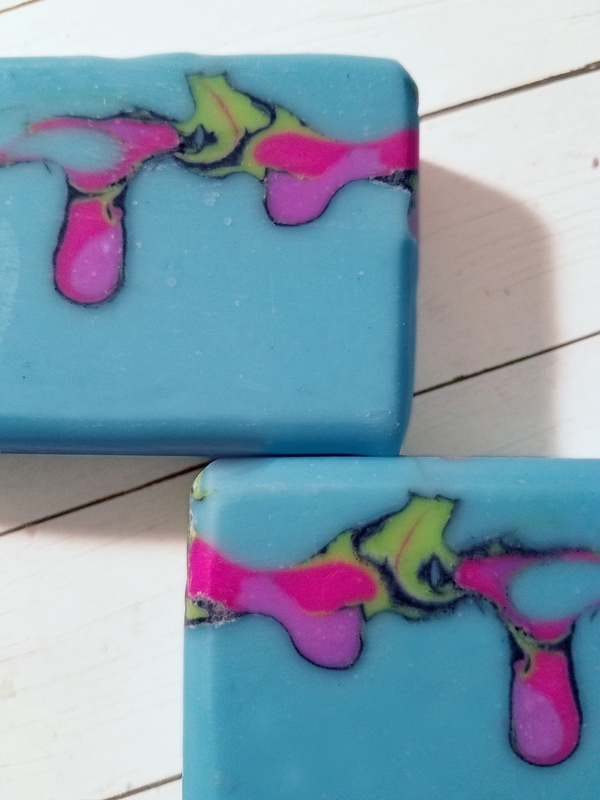 I just started pouring in the soap lines until I hit another snag; I had not used this fragrance oil before and even though all the reviews said it behaved perfectly with no acceleration, it started thickening up towards the end. I was so disconcerted by this time I ended up pretty much winging the rest of it. I realized after I finished pouring that I had completely forgotten to snip the straws to make the layers of color! Even though I knew I had created a flop, I decided to move forward as planned. I waited for the top to firm up a bit and used a scraper to create a cloud shape in the top. Normally, I would have waited until the top had completely firmed up and would then pour a freshly made batch to make a swirly top. Since that went against the guidelines, I wasn’t able to do it this way. I was also pretty exasperated at this point and wanted it all to be finished! I decided to go ahead and combine the remaining colors but not mix them until I was ready to add them to the top. That way, I could at least start cleaning up. My final mess-up was due to complete impatience. Even though I thought the batter was thick enough, and only sightly mixed to avoid making it muddy, I quickly realized that was not the case. As I scooped the mixture out, the whole thing became muddier and muddier. It ended up looking more like the color of a horrible bruise than the beautiful cloud I had envisioned! Always the optimist, I hoped I would find that my careless mistakes might have somehow magically transformed into beautiful soap overnight. I was wrong. Very, very, very wrong! I ended up with something that looked like the a view into someone’s throat, complete with tonsils and uvula. It also looked like a bacterial infestation on top!! I was able to salvage them somewhat by cutting off the bacteria-laden tops. Two of them even had what looked like tiny little frogs on lily pads in them, so that helped ease some of my disappointment! Time to Toss in the Hat? I have been absolutely swamped lately and I feared that I had just messed up my only chance to enter the grand re-opening of the Challenge Club. The stars aligned a few days later, and I found myself with a few free hours. I decided to keep things a little more simple this time and not try to bite off more than I could chew. I still had some of the mica mixed from my first attempt so I added a few other colors to make them a little more vibrant. I also chose a fragrance I have worked with many times and knew it to be a very slow mover. I don’t have many pictures of the process since my photographer/daughter was busy with other things, but I do have a few. I was a little afraid my lines were a bit too thin and would not give a drop-like shape, but I felt much better about this attempt than my previous one. I decided to add some freestyle flair to the top. I could not be more thrilled with the amazing the colors and how the design ended up! This is the first time the colors turned out looking almost exactly like they were when they were still wet. I was also tickled to see perfectly formed drops. 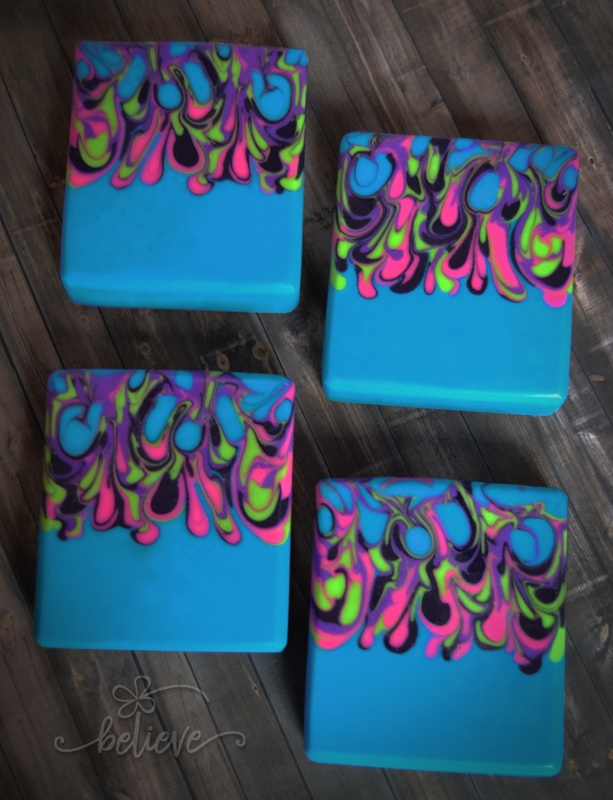 The biggest challenge I faced with these soaps was trying to photograph them. My photography skills are limited and I had a difficult time trying to capture the amazing colors as they appear in real life. It seemed like every different setting I tried to shoot in gave a completely different soap. For my entry photo, I chose the photo that most closely resembled what the colors look like in natural lighting. I have dearly missed doing these challenges over the past few months. I am also very thankful I was able to sneak away to try this challenge one more time. I am beyond blessed with the massive amounts of work I have for my business and I would not trade it for anything. It was really nice to be able to indulge in some creative play, though. It kind of took me back to my roots and reminded me of where I began so many years ago. Thank you, Amy for opening a new road of inspiration, creativity and camaraderie! I love the color of the blue! Do you mind sharing what color it is? Thank you so much, Tanya! It is a mix of colors from Micas & More – Bodacious Blue mixed with Peacock and a little bit of Turquoise. I cannot stop looking at the soap. So beautifully done. That is so kind, Anna! Thank you so much! I loved it on instagram and now that I know the story behind, it makes me love it even more ! 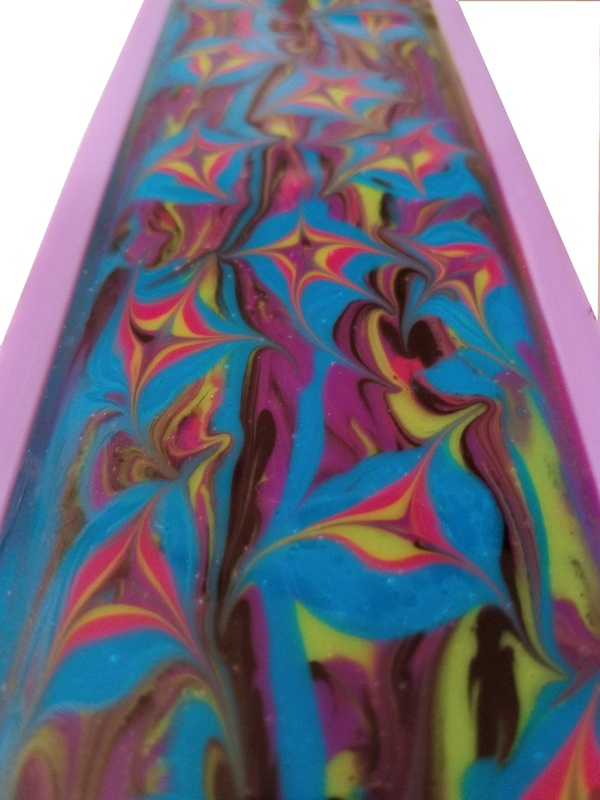 This soap is amazing, the colours are so vivid. You did a great work ! Thank you so much, Rama!! You are always so kind, Eva! Thank you! So. I hope you realize that I always save your soaps for last. 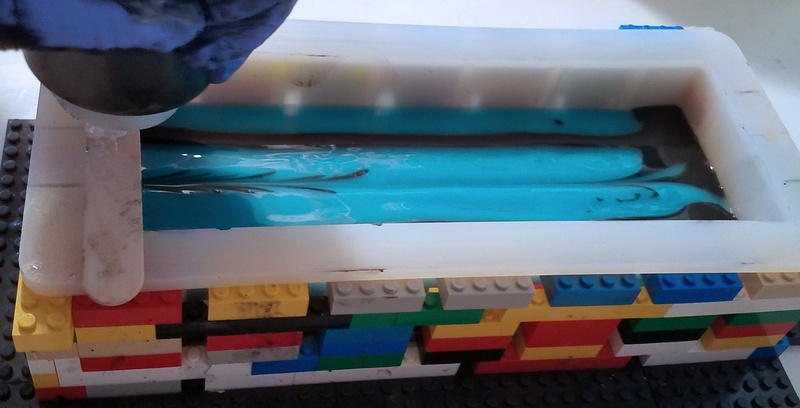 It takes me a minute to process all of the marvelous inventions you created to make the soaps (props on the lego mold!). Then it takes me another minute to stop drooling all over the keyboard!!! Debi, I have missed your posts so much! I am happy for the Challenge to be back, and equally as happy to see your thought process laid out. The soaps are exquisite and whimsical as always!! Well done, friend! You always do such a great job of choking me up, Sara! I have to say, you are – and always have been – one of my biggest supporters and that means the world to me. I cherish every single comment you have given me over the years and I am thrilled that making soap brought your friendship to me. I am so glad you enjoy my posts too, especially since you are one of the people who encouraged me to make this blog! Thank you for everything! 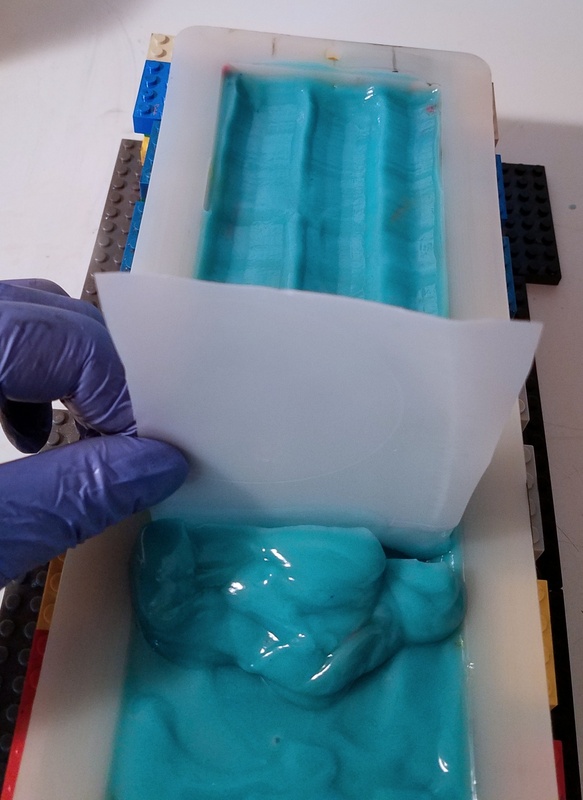 Love your soap and your post – the details of your first try really help a somewhat newbie like me learn. Your second try is a real stunner! 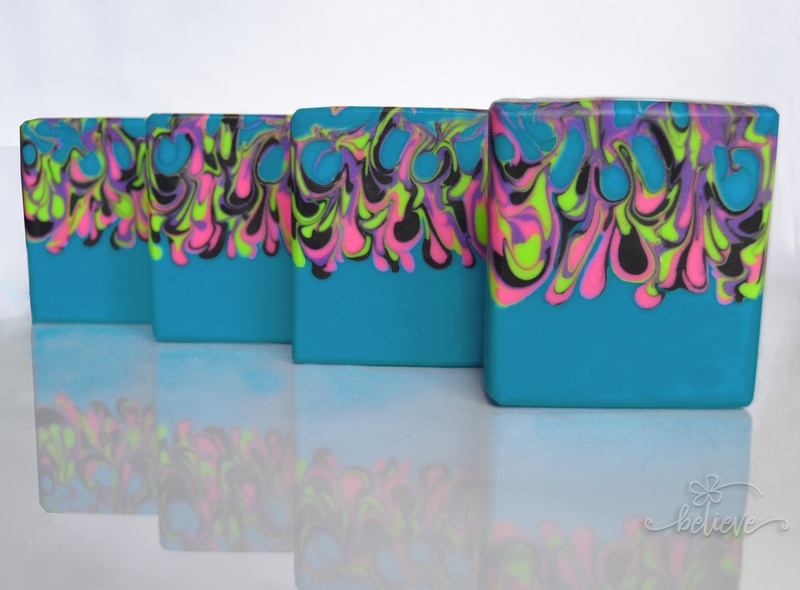 Beautiful colors and excellent execution of the mini drop swirls! So glad to have these soap challenges back! We all learn so much! Thank you so much, Gwenn! I’m glad it was helpful to you, that’s exactly what I was hoping for when I wrote the post. Personally, I learn so much from all the successful soap, as well as the failures. If my flops can help anyone – they are definitely worth it!! 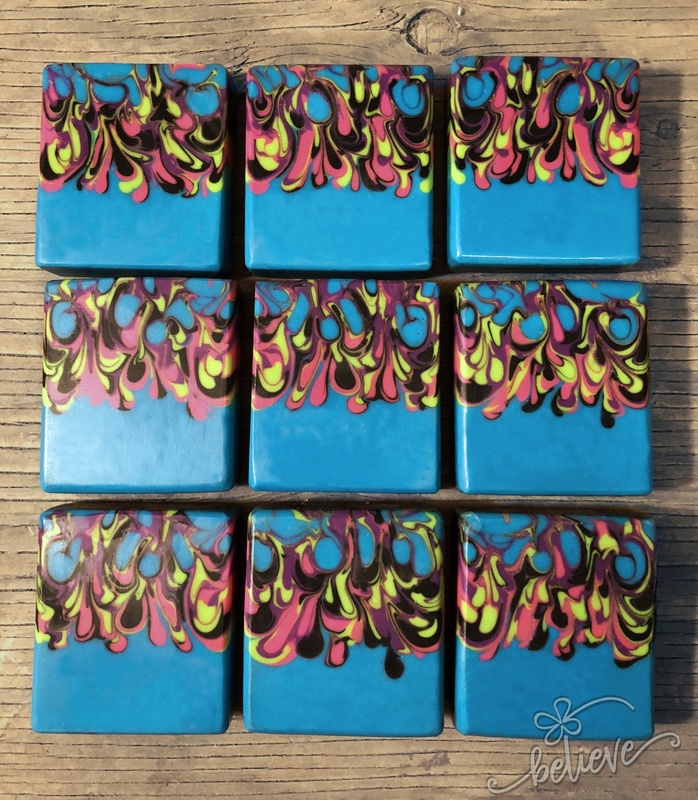 Debi, When I saw these gorgeous soaps on Instagram, my first thought was “I cannot wait to read the blog post and see how she made these!” I’ve missed your soap challenge club posts! 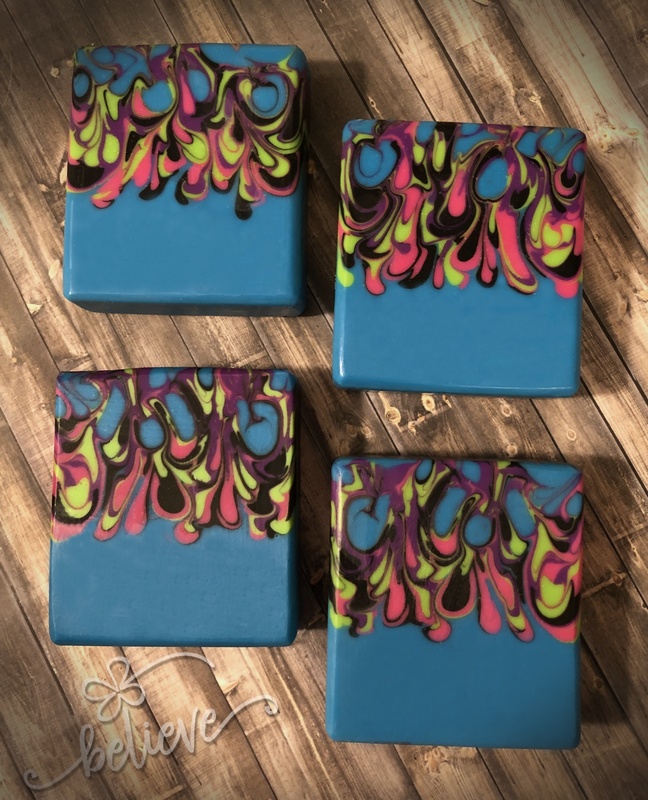 These soaps are just perfect – from the colors you used to the way the swirls drop down into the base. Absolutely love these!! Aww, thank you, Holly! I almost didn’t do a blog post but I couldn’t pass up the chance to show off my Throat Soap, LOL! I’m so happy to be back in the Club and the opportunity to reconnect with my favorite people, like you – and to meet all kinds of new people, as well! Wow Debi, your soap turned out so great! The colours are beautiful, like a true kaleidoscope. Good luck in the Challenge, I am also really happy that the Club is back on track :-). Thank you so much, Muriel! I am so happy to be back at the Club again, too. It feels like home again! Wow, Debi! 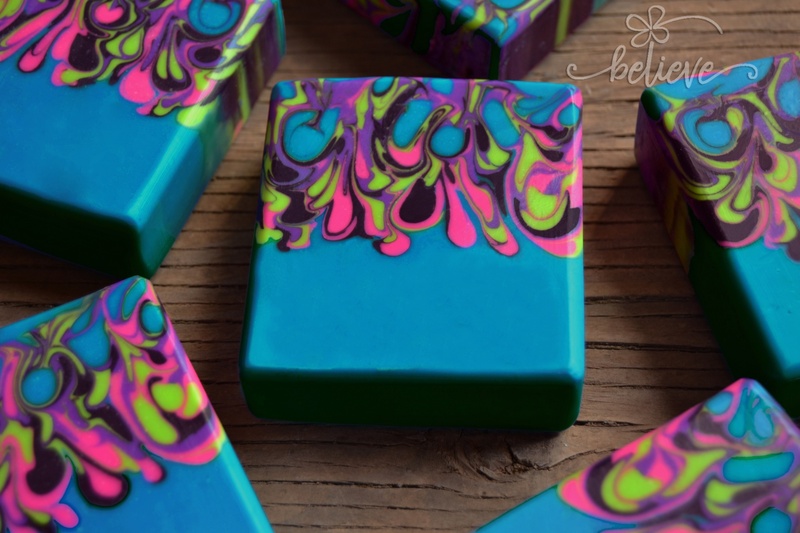 A gorgeous stunner of a soap…so glad that you gave it a 2nd try! Really enjoyed reading about your first soap. The uvula and tonsil and bacteria part gave me a great chuckle and almost made me lose my swallow of tea. It was truly a good idea to start with though. I love your use of colors, especially the blue! It’s so great to be part of this club again, such inspiration!! Thank you so much, Cheryl! I’m glad you were able to get a chuckle. I’m also very happy to be a part of the Challenge Club again, myself. I just love reading all the soapy stories and reconnecting with amazing soapers like you! I love everything about this soap. The colours don’t just pop, they ring, and the drops are beautifully formed and very pleasing to the eye. I was doing facepalms as you were telling your story of the original soap – I was right there with you as the gremlins got involved. But the final product is way more beautiful than your concept picture. You are always so incredibly sweet and very supportive, Lisa! Thank you so much. I’m so happy to have the Challenge Club back and the opportunity to connect with amazing people like you again! Oh, Debi! I’ve been traveling and this was the first chance I had to read your entire blog post. I always enjoy seeing the process you devise when attacking a soap challenge! Your end result couldn’t be more stunning. Absolutely gorgeous! Thank you, Marty! I have come up with some pretty wacky ideas over the years, that’s for sure. Thanks for taking the time to read it! Oh my, your colors are awesome. 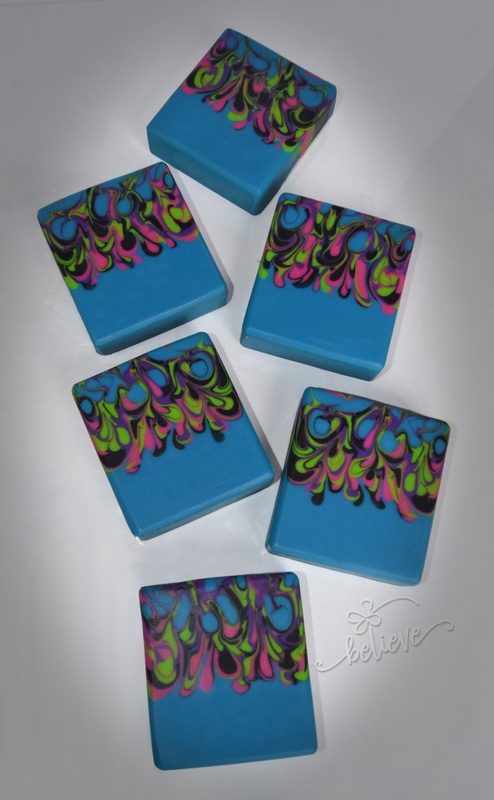 Great job on the soaps, they are so pretty. My first attempt was a total flop as well! The batter thickened up immediately and didn’t even have any drops, just lines. Love your colors. Nice save! First, let me just say how genius the legos are! Second, those colors! Ah. Mazing! Thank you, Faye! I was so happy to finally find a use for my son’s old Legos instead of letting them collect dust! I just adored your colors and your discussion on your process. We have similar thoughts and a similar taste in pallet! Your soap cake out just lovely!! Debi, so pretty – love the bright colors. Lots of WOW there. Debi, I love these bright colors! So vibrant and a very 60’s vibe. 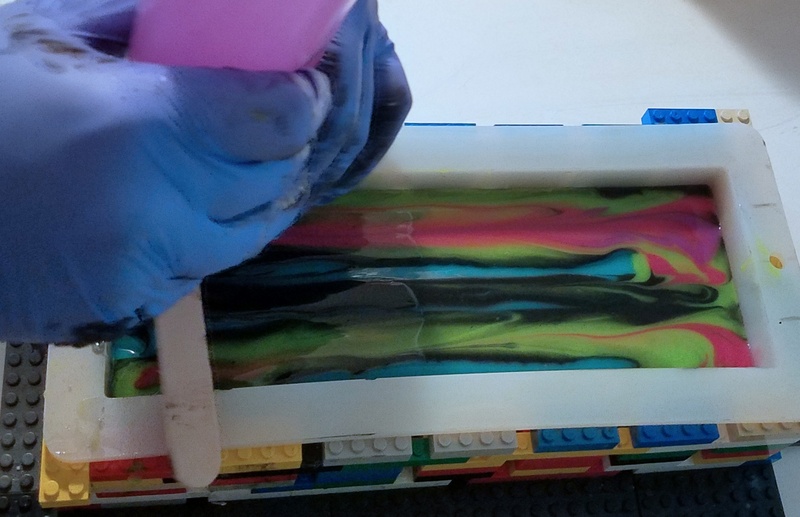 I’m glad I’m not the only one that uses Legos for soaping (lol!). Great job! Thank you so much, Leilani! I always knew my son’s Legos would come in handy someday! I love your soap. you did a great job! i voted for you! Aww, Leslie! Thank you so much!! I am slowly making my way through all the entries. If only the rest of my work would just simmer down so I can look at all the pretties!! You are always so kind and supportive, Yvonne! Thank you so much! Awww, thank you so much Taralyn! You are so welcome, Sly! At least it showed you what NOT to do! That is very sweet, Keely! Thank you so much! Thank you so much, L’ubica! I was very happy with the results! Man! I am truly in love with this one! Amazing colors. Love your detailed process explanation! Thank you so much, Penny! I was pleasantly surprised with the colors. It sure made up for my disastrous first attempt! Ahhh, the tears are flowing over the debacle of your first soap! That was quite the commentary! The entry looks amazing, of course! Beautiful colors and drops….amazingly smooth batter and gorgeous photos despite your claim to be a terrible photographer. Thank you, Amy! I wasn’t going to do a blog post but with the the extended entry time I decided to go for it. I was hoping others who might have struggled with the technique might get a laugh at my “Throat Soap”! As for the photography, I have no idea how to adjust the settings to get what I want. I just turn the dials and play around until I get one that looks right!